A dust storm shrouds Mars, a 'blood moon' dazzles eclipse-watchers and more stellar highlights. 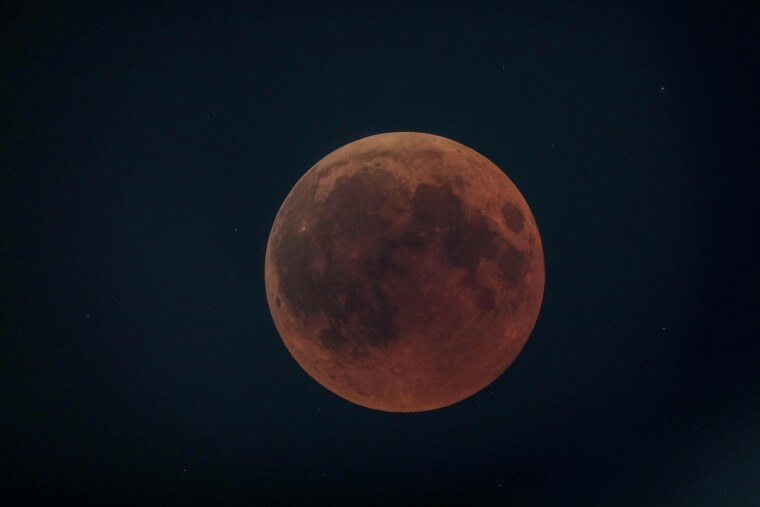 The moon is bathed in red during the lunar eclipse on July 27 as seen from Magadi, Kenya. 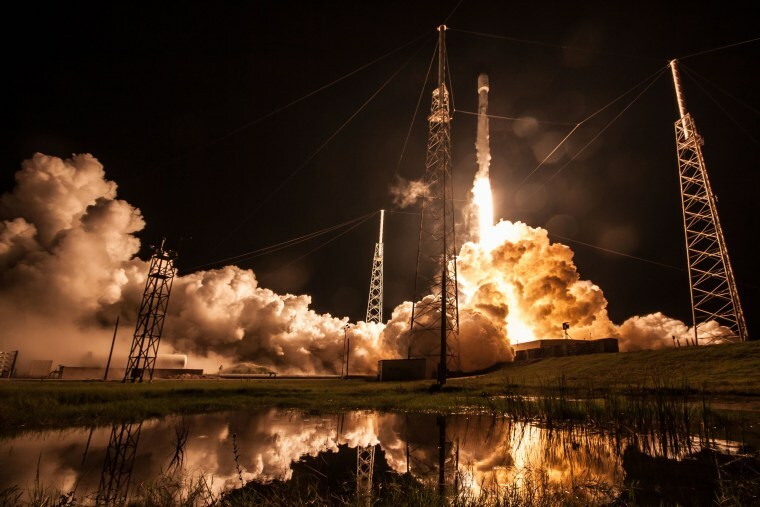 A SpaceX Falcon 9 rocket launches from Cape Canaveral Air Force Station in Florida on July 22, carrying a Telstar 19 Vantage satellite. 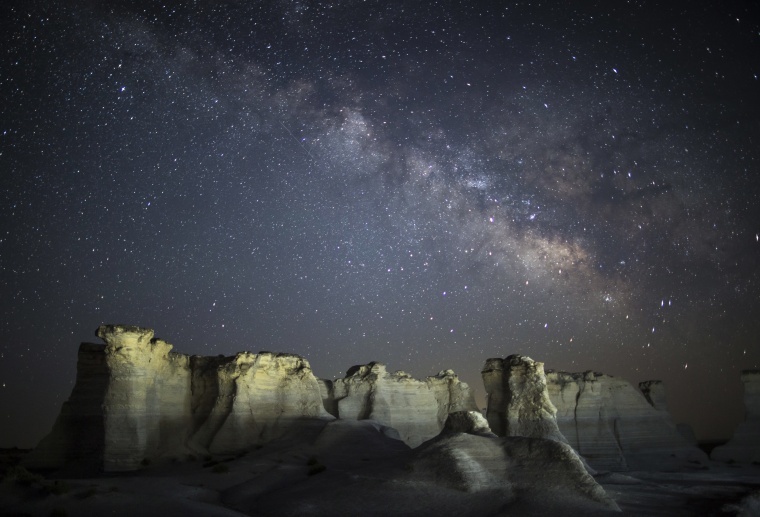 The Milky Way glows in the sky over a geologic formation known as Monument Rocks in Gove County, Kansas. The Milky Way is best viewed on moonless summer nights, far from the light pollution created by cities and towns. Astronomers believe our galaxy contains about 200 billion stars. Saturn's ring system appears especially magnificent in this newly released image from the Hubble Space Telescope because it's at nearly its maximum tilt toward Earth. 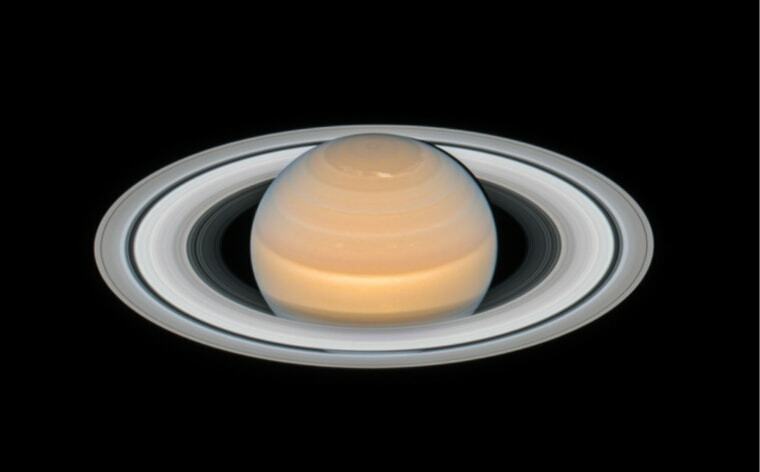 Hubble observed the planet on June 6, when Saturn was only approximately 1.36 billion miles from Earth, nearly as close to us as it ever gets. Saturn was photographed as it approached a June 27 opposition, when the planet is directly opposite the sun in the night sky and is at its yearly closest distance to the Earth. Though all of the gas giants boast rings, Saturn's are the largest and most spectacular, stretching out eight times the radius of the planet. SpaceX's Dragon cargo craft approaches the International Space Station on July 2. 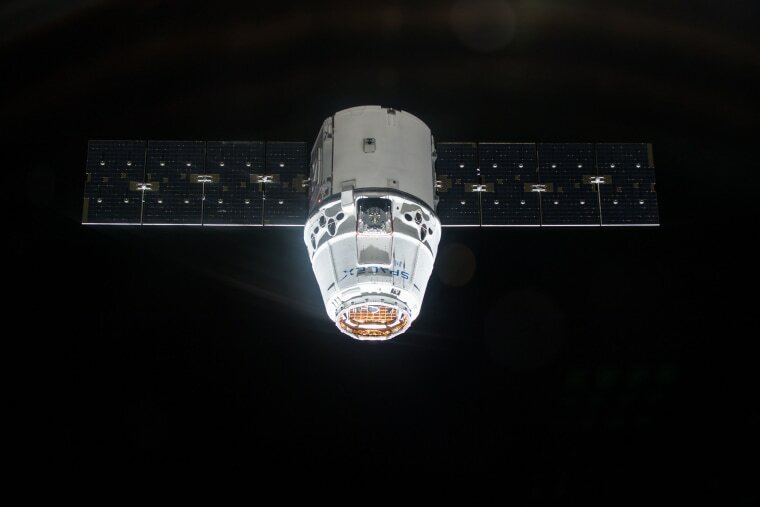 Currently, Dragon carries cargo to space, but it was also designed to carry astronauts. On Aug. 3, NASA is expected to announce the first crewmembers for manned test flights aboard the Dragon capsule. 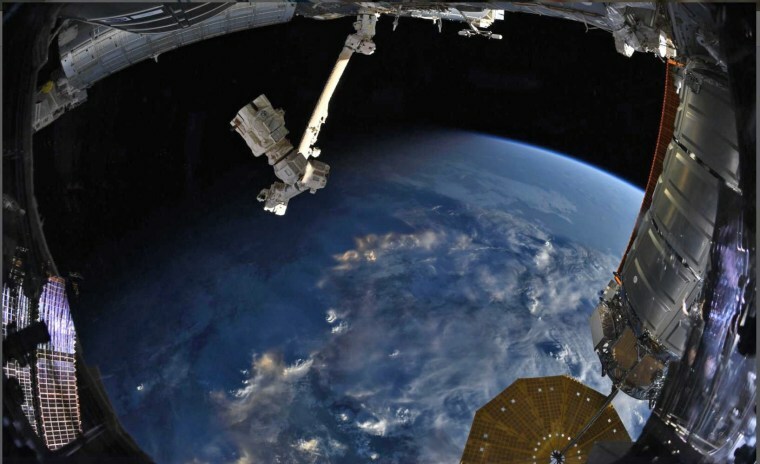 German astronaut Alexander Gerst posted this photo on July 4 from the space station, commenting "Flying over the day-night divide always feels a bit creepy. Maybe that's why it is called the 'terminator'... "
The line that separates day and night is also referred to as the "grey line" and the "twilight zone." 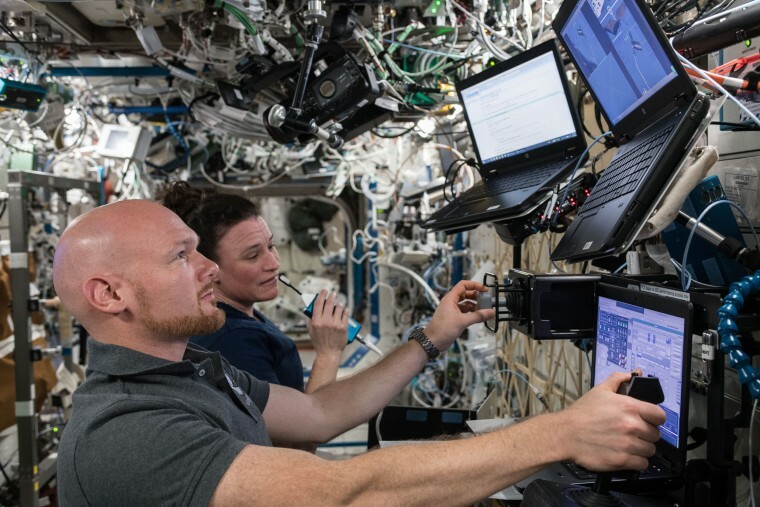 Alexander Gerst and NASA astronaut Serena Aunon-Chancellor train on computers for the release of the Northrop Grumman Cygnus space freighter. 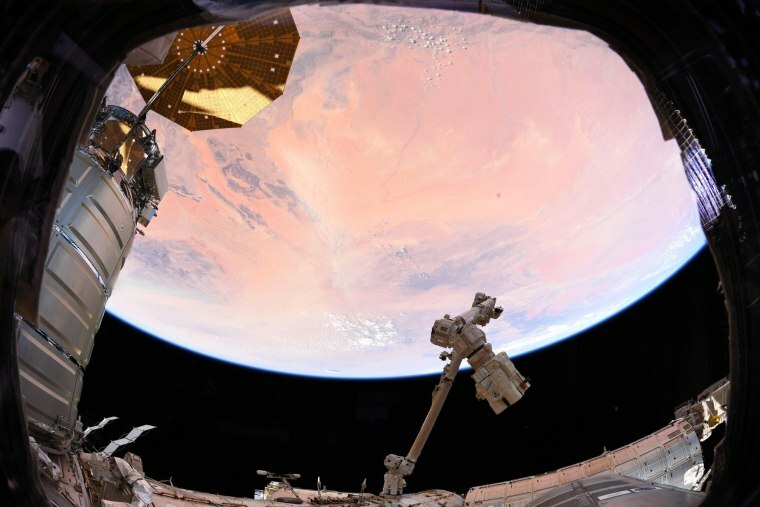 The duo used the Canadarm2 robotic arm to release Cygnus back into Earth orbit on July 15 after 52 days of cargo transfers at the station. NASA astronaut Ricky Arnold posted this image on July 11 from the space station of the Betsiboka Estuary on the northwest coast of Madagascar. 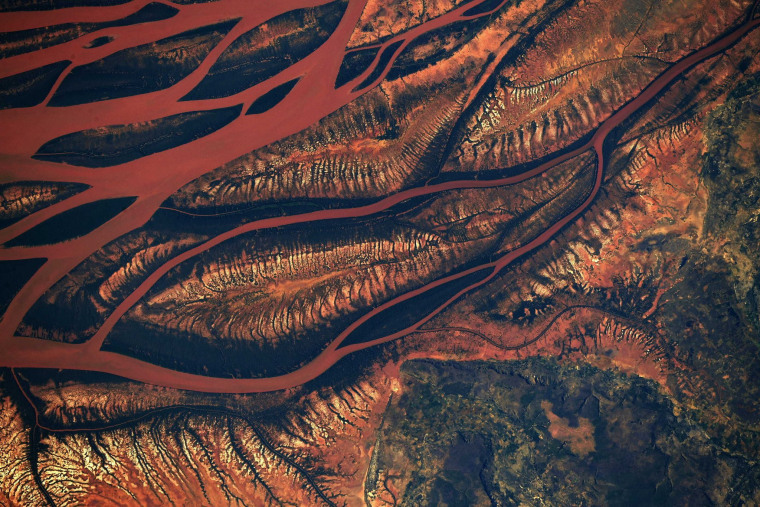 The estuary is the mouth of Madagascar’s largest river and one of the world’s fast-changing coastlines. "The heart of Madagascar drains into the sea due to decimation of rainforests and coastal mangroves," wrote Arnold. 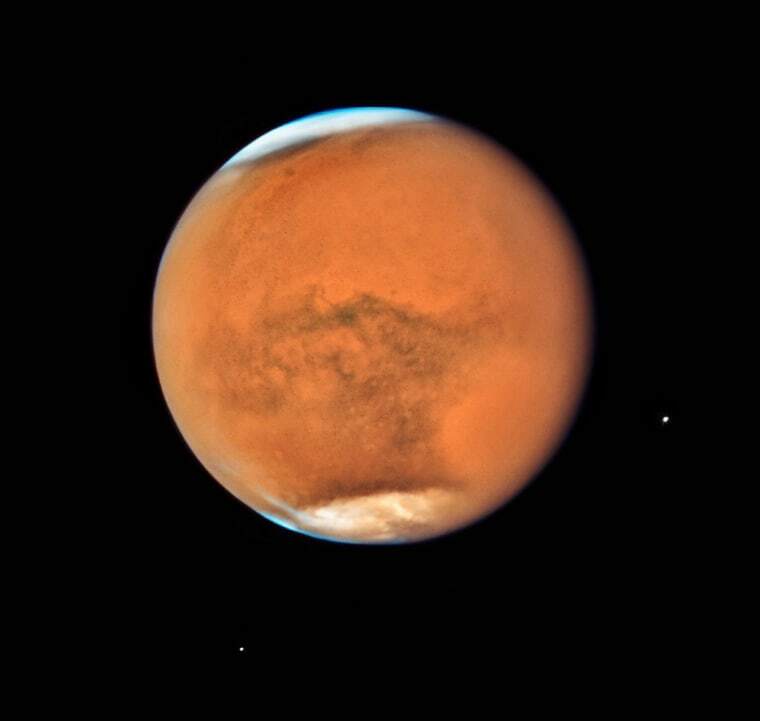 A gigantic sandstorm enshrouds Mars in this image captured by Hubble in mid-July. Each Martian year, large dust storms cover continent-sized areas and last for weeks at a time. This storm has lasted for more than a month, plunging the planet's surface into perpetual darkness. The two small moons of Mars, Phobos (right) and Deimos, appear in the lower half of the image. At first glance, it may seem as though this image was taken through a faulty lens, but the mind-bending distortions visible in this Hubble image are actually caused by a cosmic phenomenon. 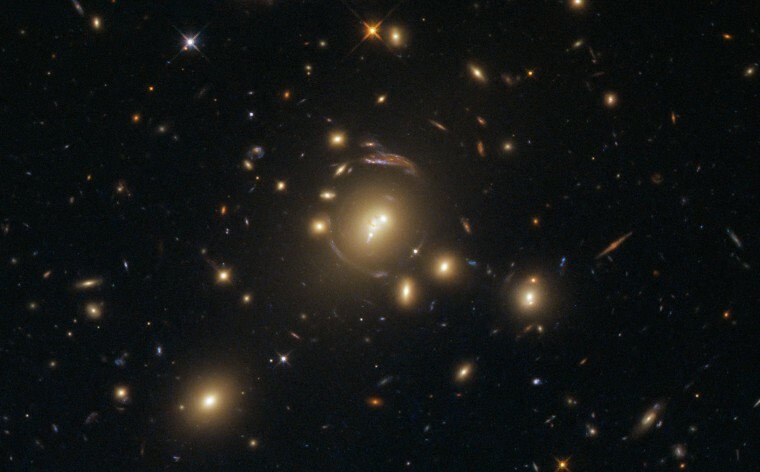 The bright object at the center of the frame is the galaxy cluster SDSS J1336-0331. The enormous gravitational influence of the cluster warps the very shape and fabric of its environment (the spacetime around it) creating an effect known as strong gravitational lensing. Through this, the light from background galaxies in the line of sight to the observer are bent into fantastic arcs. 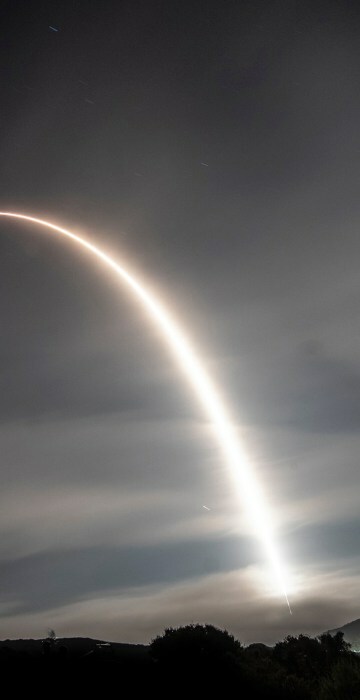 A SpaceX Falcon 9 rocket launches from Vandenberg Air Force Base in California on July 25. 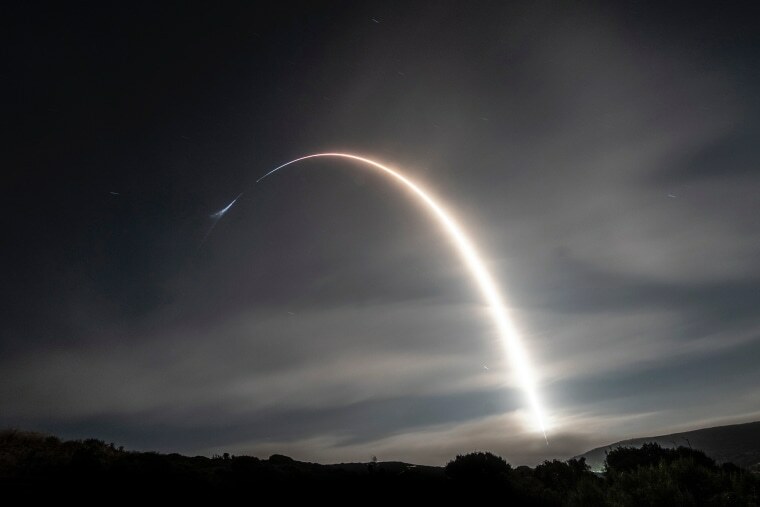 Ten Iridium NEXT satellites were put into orbit, the seventh set of satellites in a series of 75 total satellites that SpaceX will launch for Iridium’s next-generation global satellite constellation. 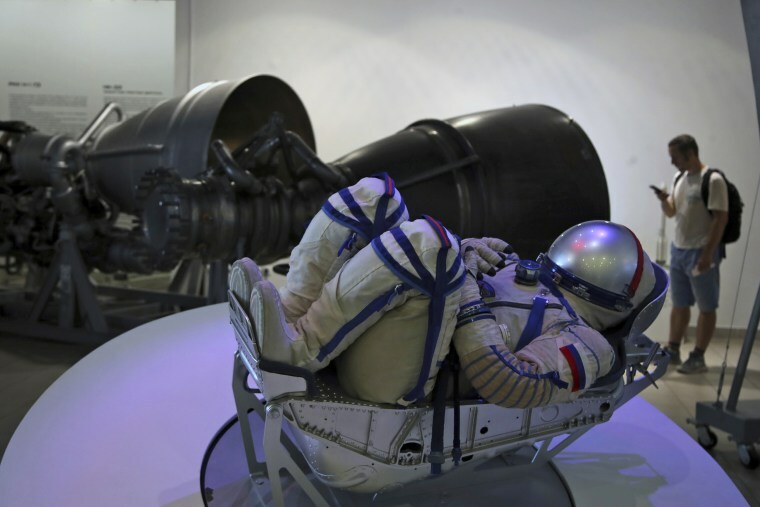 A tourist visits the Space Museum in Samara, Russia, on July 8. The southeastern city is known for the production of aerospace launch vehicles, satellites and various space services. 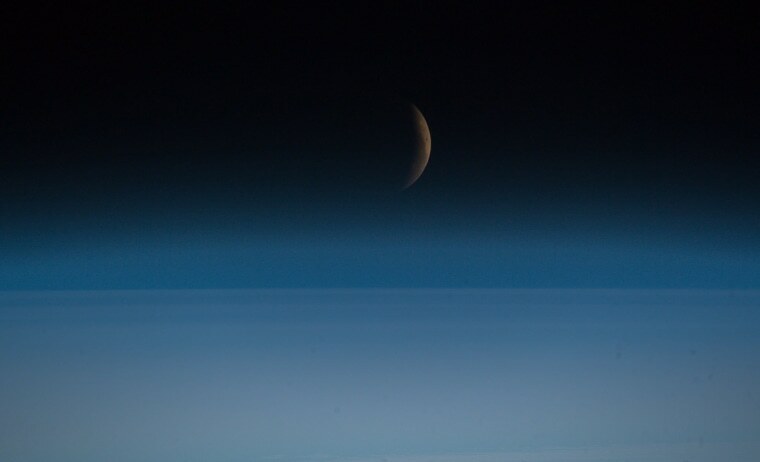 From his perch on the space station, Alexander Gerst captured this final image of the lunar eclipse as the moon left Earth's core shadow just before setting over the South Atlantic on July 27. "Could you tell if this is Earth or Mars?" asked Alexander Gerst when he posted this photo on July 2. "Maybe we share more similarities with our orange neighbor than we would like?" 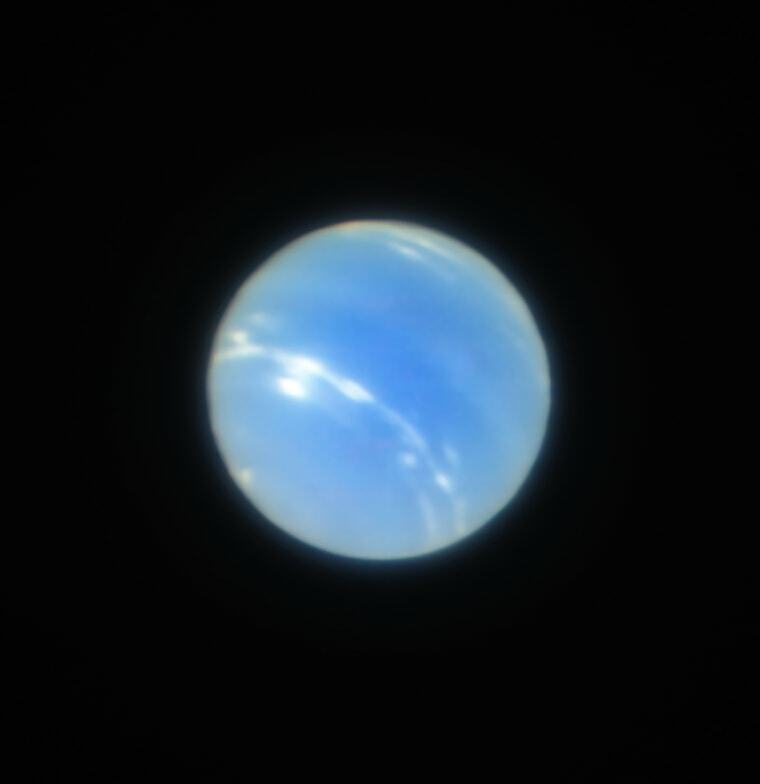 Scientists have upgraded one of Earth’s most powerful telescopes to help it compensate for the atmospheric light-scattering that can make photos taken by ground-based telescopes appear blurry — and this stunning new image of Neptune show just how sharp such photos can now be. 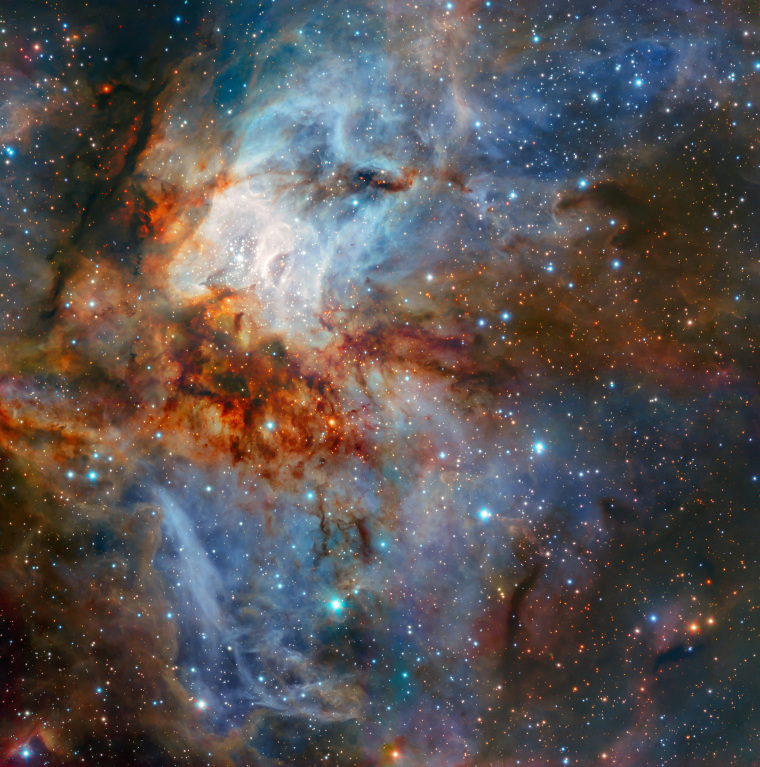 The star cluster RCW 38 and its surrounding clouds of brightly glowing gas appear in exquisite detail in this image released by the European Southern Observatory on July 11. 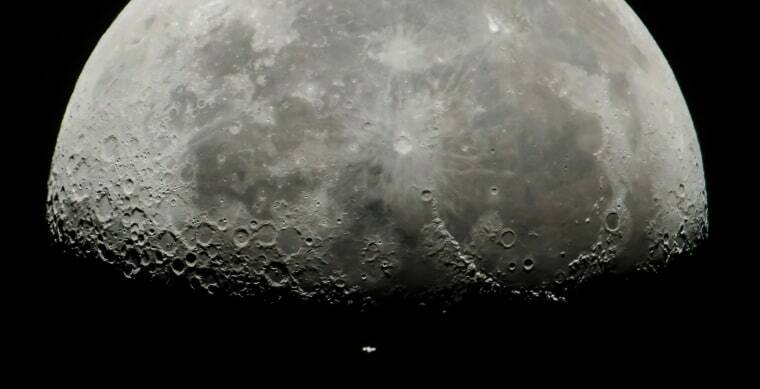 The space station is visible as a tiny white shape at the bottom of the frame as it passes in front of the moon on July 5, as photographed from Salgotarjan, Hungary, on Thursday. An international crew of six is currently living and working aboard the orbiting outpost. 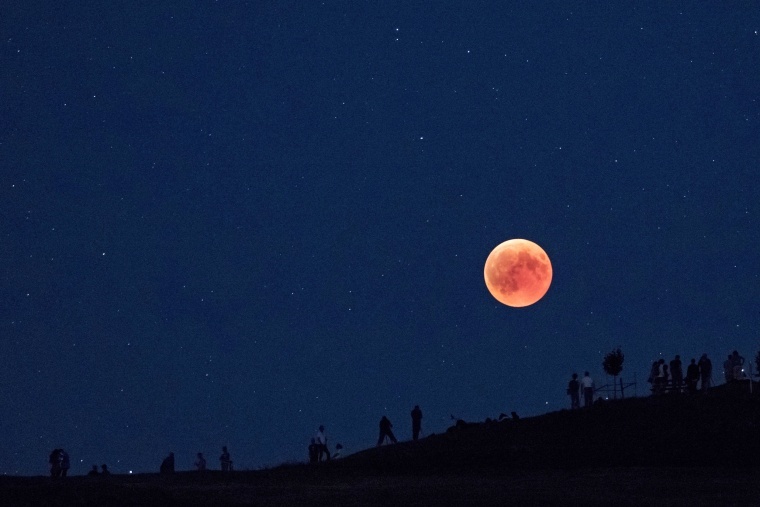 Spectators watch the moon turn red from Switzerland's Zugerberg mountain during a total lunar eclipse on July 27. Lunar eclipses occur when the moon, Earth and the sun are aligned and the moon passes into Earth’s shadow. This eclipse was the longest of this century.